The Nissan GT-R has gone far on the factory ECU. Well over 1000 horsepower and 8 second timeslips have been had by cars with a "reflash" and the standard box. More recently there have been rumors about the Motec engine control unit and a seperate stand alone transmission support control unit. 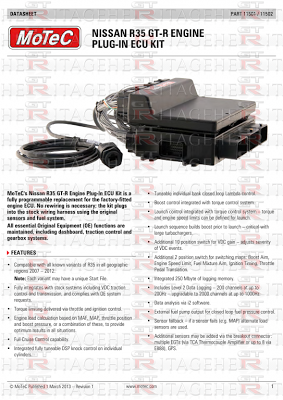 Well finally there are some details on the Motec M1 stand alone engine management for the R35 GT-R. Ian from GT-R Heritage posted up a flyer on the new product. Check out the thread and links for more information.